Holley Standard Main Jet 89 Hole size .1045"
Holley main jets allow you to fine tune your carburetor. 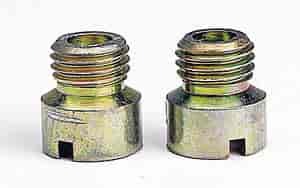 These jets have 1/4"-32 UNF thread and they are offered in a wide variety of hole sizes to allow fine tuning of your specific application. Note: Jet hole sizes provided below are for reference only. All Holley jets are sized by actual flow and may vary slightly from the sizes listed. JEGS 15273 - Anodized Float Bowl Catch Can 1-5/8" x 6"